Postings have been a bit slow lately, but I totally blame Chincoteague for that. 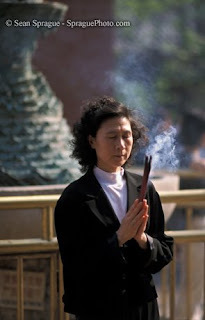 Incense might be symbolic in religious ceremonies, but it has also, perhaps not so coincidentally, played a role in gathering the faithful into the fold. A team of international neuroscientists has just announced that a component of the resin made from Boswellia trees, more commonly called Frankincense (yes, the same stuff brought to baby Jesus by the Three Kings), biochemically relieves anxiety in mice, and presumably people. Although religion is usually considered a purely cultural construction, it might also have deep psychotropic roots. The recent research, published in the online FASEB Journal (Federation of American Societies for Experimental Biology) on May 2, suggests that religion, or at least many religious rituals, might also have another evolutionary, or biological function. Along with the group support, the embracing identity and the place to pray when times are bad, some religions are also doling out a bit of a psychotropic drug that helps the mind find peace. Under the influence of a good snoot full of incense, mice in scary situations, such as being put in a swimming pool, remain calm, anxiety-free. At the alter, too, people feel the same sense of peace that comes from either the comforting words of the clergy, or from the intoxicating, brain altering, smell of incense. Read the story here, and here is a link to the FASEB paper. oh boy...I don't know. My guess is that they would have taken that into account - but I haven't read the full FASEB article.